As part of Sherwin-Williams' National Painting Week celebration, they challenged several talented design bloggers to do DIY paint makeovers. 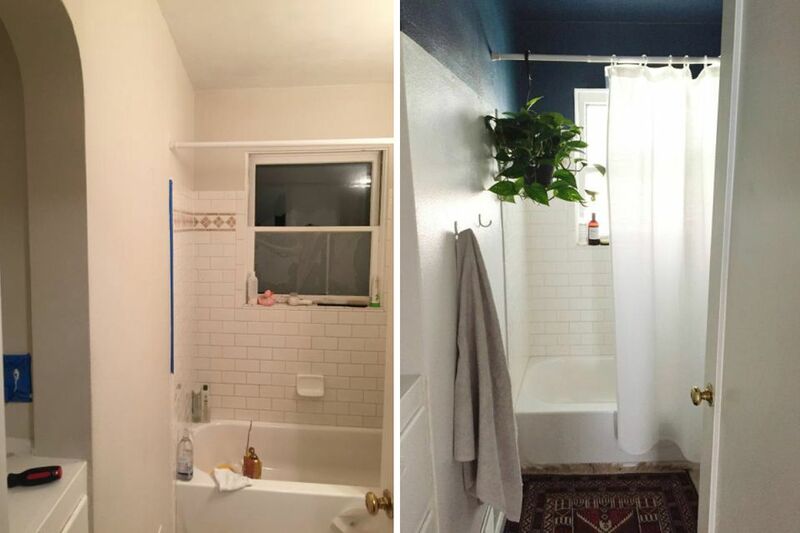 The before and after photos are so inspiring, and a great way to get ideas for your own home. Get easy tips for making big changes at home with just a little bit of paint and lots of inspiration. Sarah of Thrifty Decor Chick did a charming makeover on an already-sweet bedroom. Sarah simplified the room's decor by using one calming green wall color. Says Sarah: "I was so ready to get rid of the ombre/square look though! I was a little nervous when I poured the new paint color in the pan because when wet it looked really light (which is what I had before). But it dried to a lovely color -- a slighter deeper green tone with some gray to it." Says Sarah: "I LOVE it. Paint and a little trim were the biggest projects in here – it does take some time but it such an affordable update with a BIG impact I’m totally OK with that. If you’re looking for a gray green tone, this hue (Softened Green SW 6177) may be the one for you!" While Sarah's "before" was perfectly lovely, her new guest bedroom has a more sophisticated, finished feel and looks far more expensive than before. Beth of Home Stories A to Z had a relaxed, finished looking living room to start with, but wanted a bit of a change. Says Beth: "To update this space, I chose a beautiful gray and blue color palette which gives the room a soothing coastal vibe, perfect for summer." She turned an already gorgeous and relaxing living room, into a true masterpiece. Pay attention to her brilliant use of colors of similar intensity, which really brightened the space. Says Beth: "With a new gray rug in this space, I needed an updated wall color and this gray (SW7010 Dorian Gray) was the perfect choice! It blends seamlessly with my gray trellis rug and works much better with the cream couch. The back walls of the room are done in a gra green (SW 6204 Sea Salt) and for this makeover I just touched them up a bit. I love how this gray bluish-green hue looks with the Dorian Gray." Living in a rental can pose problems when you'd like to make the space more personalized. Generally, renters are permitted to paint their walls (but check your lease and speak to your landlord first!) Being strategic about the paint color and design can make a drastic change in a space where permanent changes aren't allowed. Says Kirsten of Simply Grove: "I like when bathrooms are bright and simple. I didn’t want to clutter this little bathroom but wanted to make it seem light and open." Says Kirsten: "I chose white (Extra White SW 7006) on the bottom and this gorgeous blue, (Seaworthy SW 7620) on the top quarter of the walls and ceiling. The blue added some much needed personality while the white kept it modern. My bathroom went from total drab to clean and fresh. And it’s all because of paint!" Lidy of HelloLidy, took on the challenge of redoing a basement family room. She chose to make the cozy space over in a simple Scandinavian-inspired style. Says Lidy: "The living room was so very confused and uninviting! The walls were daring, but not in a good way and decorating this space was very limited! It just wasn’t us." The reveal of this stunning family room shows a fresh and uncluttered style, with just a touch of color behind the useful shelving to the right. Says Lidy: "My aim was to create a colorful Scandinavian-inspired family room, so it flowed with the rest of the home. The whole principle of Scandinavian design is a good rule of thumb when decorating any space in your home. Just think simplicity, minimalism and functionality." Triangles in white, black (Tricorn Black SW 6258) and blue (Tame Teal SW 6757) now decorate the space, and really make the walls pop. Making over a porch is a task that is often put aside in favor of indoor decorating needs. But taking the time and creativity to redo your front porch can yield more than just curb appeal, but a new space to enjoy. Says Alicia: "In the beginning, the Curbly House porch the province of mean squirrels and soggy carpeting. And then, while we focused on fixing the inside of the house, it got worse; a dumping ground for construction debris, and later storage space for sleds and strollers." Look at all that wonderful space for relaxing! The couple painted the walls (Dovetail SW 7018 ) and trim (Kestrel White SW 7516), and refinished the floor as well. Says Alicia: "The result is a space we love. We are enjoying an early spring in the Midwest and we are taking advantage of the long sun-filled evenings on our pleasant porch." Making over a teen room is not the easiest project to take on. The space needs to be functional, abut also suit the needs of ever-changing tastes. This teen room is stylish, but also can adapt to a variety of interests. Says KariAnne of Thistlewood Farms: "I think I painted it this baby blue color the year he spent trying to convince us he was a Tyrannosaurus Rex. It was time for a change." This is an incredible makeover! Though it's perfect for a teen's room, this design could also work well for a cottage-style guest room. Says KariAnne: "We kept the original bed and painted the prettiest navy blue (Naval SW 6244). There’s a hint of gray undertones with rich, cool tones. We created a focal wall with wood planks from the home improvement store." The walls were painted a soft white (Wool Skein SW 6148) She also pulled up the carpet, sanded the floor and painted it greige (Stamped Concrete SW 7655).